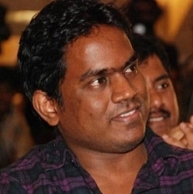 Yuvan's 100th musical, Biriyani is releasing today, the 21st August, and his fans and well-wishers have taken to the social media space to wish the 'young rockstar' on his well-deserved century in the industry. The keyword #Biriyani is trending all over India in Twitter. With the recent furor surrounding the leak of the album, a lot of people have taken it upon themselves to buy the original music of the film and show their support to a musician, who has been flourishing in the industry for so long. The Biriyani album is already out on iTunes and it is expected to be out on YouTube later in the day. CDs are expected to be gobbled up in double quick time by Yuvan fanatics. So are you buying the original music of Biriyani? Thalaivar Craze Refuses To Recede! "Up Close & Personal With Anirudh Ravichander"